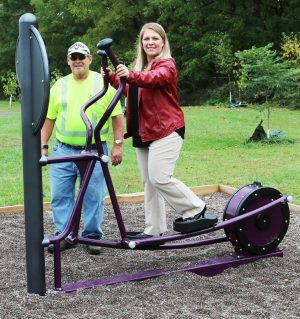 Leanna Cleveland, coordinator of Community Health with Oswego County Opportunities, uses one of the exercise machines located along the new fitness trail in Van Buren Park. The half-mile fitness trail connects the tennis courts, playground, pavilion, and fitness equipment. Also pictured is Sixth Ward Common Councilor Lawrence Macner. FULTON, NY – It began last fall with the addition of several pieces of exercise equipment. Now, the transformation of Fulton’s Van Buren Park continues with the completion of a half-mile walking trail that passes through a picturesque row of shade trees. The Van Buren Park Fitness Trail is the result of a collaboration between Oswego County Opportunities and Friends of Fulton Parks. “The missions of OCO’s Impact Program and Friends of Fulton Parks, and our shared goals of providing opportunities for healthy outdoor physical activity in the community, aligned to create a great collaborative team,” said Kelley Weaver of Friends of Fulton Parks. City of Fulton Parks and Recreation Superintendent Barry Ostrander worked with the Atlantic States Legal Foundation and the Great Lakes Restoration Initiative. As a result, more than 180 trees were planted in Van Buren Park. While the Van Buren Fitness Trail is relatively new it has seen substantial use and continues to attract more walkers. With the Van Buren Park Fitness Trail completed, Friends of Fulton Parks is currently working on the completion of the Teen Haven at the Recreation Park and anticipates its opening in late October. Did you know? One of Oswego County’s largest employers, OCO provides more than 50 human service programs that touch the lives of approximately 20,000 county residents each year. OCO’s mission is to build partnerships that improve the quality of life and create successful communities. Visit OCO on the web at www.oco.org. Oswego County Opportunities is a member agency of the United Way of Greater Oswego County. Friends of Fulton Parks is a 501(c) 3 not-for-profit volunteer organization. Its mission is to preserve and revitalize Fulton’s parks through collaborative restoration and community events in the parks. For more information on Friends of Fulton Parks or to become a volunteer contact FoFP at [email protected], check out FoFP on Facebook: www.facebook.com/friendsoffultonparks, or visit friendsoffultonparks.org.